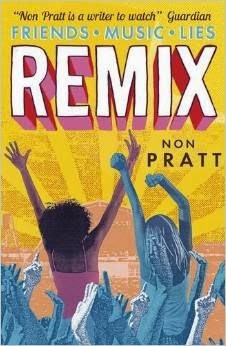 It's always difficult to follow up a critically acclaimed, pretty much universally loved first novel, but Non Pratt has risen to the challenge with her second book, Remix. Kaz and Ruby are heading off to Remix, a three-day music festival that is sure to be populated by cool bands (including the hot, hot, hot Adam Wexler of Goldentone), friends galore, and plenty of sunshine (hopefully). Kaz is still not over her ex-boyfriend Tom, and is hoping Remix will give them the chance to rekindle their romance, while Ruby is definitely over her ex-boyfriend Stuart, and is looking to have the time of her life. But with the sun shining down and everyone camping in close quarters, the drama is sure to be top of the bill. Pratt's first novel Trouble tackled teenage pregnancy and what it means to be a family, and in some ways Remix also looks at the latter. And just like in trouble, things get complicated when it comes to family. Kaz and Ruby have been friends for so long that they're practically sisters, which becomes a problem when Kaz makes a new friend while at Remix. Ruby's jealousy is a bit like that of a sister who is being suddenly ignored after years of being worshipped. And Kaz feels Ruby is holding her back, and not wanting her to have fun and become her own person. The stuff between Kaz and Ruby is excellent. Of course the situation, taking place over three days, is slightly accelerated but the emotions and reactions are realistic. As well as the family you make, the family you're born with plays an important part in Remix, with Ruby's brother acting as a rock to Ruby as well as being an idiot when it comes to his love life. And Ruby's parents, while unseen by us, loom over the teenager, who is unsure about her future. Meanwhile Kaz's younger sister is a typical pain in the backside, but also more complex, pulling through for Kaz when she's needed. Where I didn't love Remix as much was on the boy stuff. I love a good romance as much as the next person, but I felt perhaps there was slightly too much romance (and the complete opposite) going on. Having a female come between Ruby and Kaz was clever and really worked, so I think I probably could have done with less of Stuart, and definitely less of Tom and Adam (but maybe that's more to do with the type of boys/men they are). The romantic relationship I probably enjoyed reading the most about was Lee and Owen (I'd love to read a short story about them before Remix). One thing I must congratulate Pratt on is the diversity within Remix, which is subtle but there if you're looking for it (and I'm always looking for diversity in books). She doesn't make a huge deal of her diverse characters, but there are people from different ethnicities, different sexualities and different weights, all of whom play a crucial role. The best thing is that the diversity is just there. It must have been daunting writing a follow-up to a brilliant book like Trouble, but overall I think Pratt has succeeded with a fun, realistic look at friendship. Remix captures the vibe of summer perfectly, so make sure you pack it for your holiday. *Remix is out in the UK on June 4 2015. How I got this book: From the publisher, Walker Books. This did not affect my review.